A Tragic News Story from Deptford. The fatal fire at Deptford was as sad in its consequences as the calamitous conflagration at Bethnal Green. We give a photograph of the fireplace of the room at 35, St Johns Road, Deptford, taken soon after the melancholy disaster on the 5th inst. At the inquest on the bodies of Thomas Aberthell aged 4 years; Amy, 3 years; Lily, 18 months, and Rose, aged four months, the four children who were asphyxiated in the fire, Lillian Aberthell, the mother, deposed that she left them sitting in the kitchen while she went to fetch some fish for her husband’s tea. When she had been away for about a quarter of an hour she returned, and was horrified to find the kitchen in flames. There were several people there, but apparently no one had made an attempt to save the children. She at once rushed in and succeeded in bringing out the two youngest but they were apparently dead. 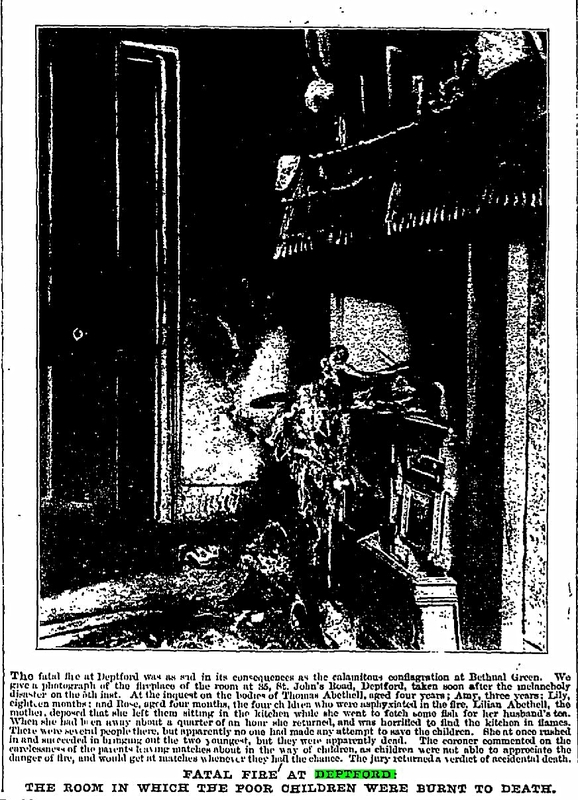 The Coroner commented on the carelessness of the parents having matches about in the way of the children as children were not able to appreciate the danger of fire, and would get matches whenever they had a chance. The Jury returned a verdict of accidental death. Shame I can't read the print on this.